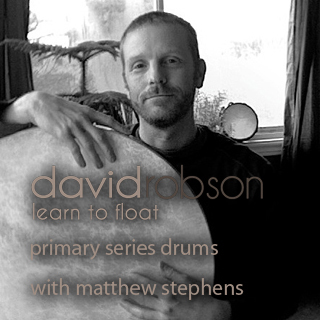 Yesterday I posted about David Robson's Learn to Float Primary series with Drums, this morning I thought I'd give it a try with 2nd series. As well as the Led Primary, David has an MP3 of just Mathew Stephan's drums, perfect. Perhaps the drums come into their own even more here. The full count in Pasasna and keeping the breath nice and regular with the beat is challenging, even more so with the Salabhasanas and Dhanurasanas, kind of realise how much I must cheat. And then there's Kapotasana, the Charcone of Ashtanga 2nd, again tricky to keep the breath full and regular here but the beat helps. I've only just started going this deep again recently so found it particularly challenging to stay the full five and then for another five in B, in fact I think I might have come up one early. David needs to come out with a Led 2nd series with drums. I only practiced 2nd up to and including the twists so I could move on to my more involved finishing and pranayama. Oh the drums are nice for dropping back and coming up too. Tried the drums with the pranayama as an experiment but it got in the way of my mantra, became irritating so knocked it on the head. You can see from the video below that it doesn't really work out, not sure how to sync it, how many rounds an exhale or for the kumbhaka etc, bit of a mess which is why I'm not posting it on youtube just putting it straight on the blog (which means it wont show up on iPad etc just on your desk or laptop). You can get an idea of where I am in the breath cycle by the deep uddiyana on the kumbhaka around two minutes in and the second one at 2:55. You can see it's going wrong by the sharpish intake of the breath at the end, following the beat rather than my body and getting the rhythm all wrong, not ideal here. 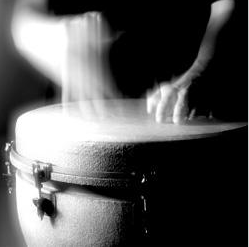 "Follow Matthew Stephens hypnotic, subtle drumming to sharpen your focus and time your breath as you practice. At a steady one beat per second, this 80 minute track is a wonderful tool for self-practice and for teaching. Note that this is audio only, no video included". Hi Grimmly, this is the first time I've checked your blog since you went into the cave. You're really into the counting of breaths! Before the drums, did you use a metronome at all? And did you just count mentally 1,2,3 or use fingers some how? I've just finished the yoga anatomy book by Leslie Kaminoff, for several asana the author points out that, because the abdominal muscles and the muscles surrounding the ribcage are used for support, then a full deep breath will not really be possible. Also, the more muscular effort a pose takes, the more oxygen required. Of course you can try (and have yourself) to slow it down, and surely things will slow down naturally over years of practice. So basically, for me, a very regular count of breath would not be suitable. It makes more sense to me for the breath to speed up/slow down with the intensity of the practice. Just a comment related to your previous post - in the mysore-style class I used to attend, things did seem a little rushed although the teacher left more time for people to get into difficult positions such as mary D and supta kurmasana. I remember spending an age getting into the "embryo in the womb" posture starting position, only for the teacher to roll me around on the floor quickly so I wouldn't get too far behind! The other thing you mentioned previously was about the 40 second stays - that is how they practice in Bikram (and they repeat each posture), so making 26 asana last 90 minutes. Sorry for the mind dump, hope you are well. Hi Rob. I used to count the breath when i first started pranayama, don't need to so much now as everything settles around the mantra, I'll count every now and again though to reset the ratio. That spilled over into asana with Jois idea of 8- 10 seconds inhalation and the same for exhalation. It matched up with what I was doing anyway in vinyasa krama, so the trick then was to bring that into Ashtanga which meant a shorter series. I tried to use a metronome but never really got comfortable with it, the drums have been fun though. Not sure how long I'll stick with them, exploring how to adapt them now, some postures will have two rounds of the drums to the inhalation some just the one. IT's useful in the stress postures to help keep the breath regulated, steady and full, kapo for example but also the binds. re the kaminoff book, i'm sure he has a point, he knows his stuff but it's also the case that we often don't create enough space for the breath. No way i can do an eight second breath in Mari D at the moment but four seconds is doable but to make it comfortable you need to find a way to open the chest up more, open up the asana more. I find that interesting, without the count as a guide, an intention you'd perhaps settle into the habit of allowing the body to collapse...especially practicing at home. re the Bikram reference, I mean really, what is the point in us bothering to learn an asana if we're only going to stay for a few seconds, all too often the vinyasa seems to have overtaken the asana as the focus of practice. I really like how David is doing the full five count throughout the series here and with the drum there's no speeding up on the challenging postures. Breath has become my focus for a while now. I find it much more interesting than trying to bend my body into yet another more advanced pose that might not even be more beneficial than a basic pose with proper breath and locks. I have left my Ashtanga practice for a slower krishnamacharya approach. I'm currently working through yoga Makaranda , keeping my practice to maybe 6-12 poses, but I am now practicing twice a day. I thought I would have missed Ashtanga but I'm sorry to say I don't. Really enjoying my practice which is surely the point and I adapt my practice depending how I feel each day. Something with Krishnamacharya's approach clicks with me - it makes more sense. My new practice has also made me want to read much more about yoga than ever before. Strange how things turn out. Hi dtw, you have a new blog, you should have told me, love the notebook. Yes, Makaranda is great to work through in the way, I'm still trying to work out what he was up to in those longer stays and then there's his use of kumbhaka, still exploring all this too ( this weeks Ashtanga has been to sweat out the last of the flu and get some strength back, although I enjoyed it and am still looking to have my cake and eat it). I think you' like one of his other sons book Emergence du Yoga when it comes out in English. My french copy arrived today and it's rather special, particularly the five or six examples of Krishnamacharya's own practice. I'm really looking forward to the english version of Emergence du Yoga. I was even half-considering ordering the french version and trying to translate it, but by the time I did that I'm sure the english version would already be released. The drums are really quite nice. I could get into that just for the sound itself. very easy to focus with it, contrary to what I had imagined. I was the same Anon, thought they's be distracting but really getting into them. Nice warm tone to them too. I had a teacher who studied Astanga with Viswanath (Jois's nephew) in Bangalore in early 200s. He had him hold each pose in primary for a count of eight with an inhale 8 count exhale 16 count. Apparently primary took about 4 hours! Thank you for this Stephan, very interesting will see what more I can find out about Viswanath. had heard the name before but didn't know he was a nephew. I'm Interested in the period Pattabhi jois was teaching between 1950's-70. Catching heels again in Kapo...Now what?